Mazen Maarouf is a Palestinian-Icelandic writer, translator and journalist. Born in 1978 to a Palestinian refugee family he lived, studied and worked in Beirut before moving to Iceland. In 2008 he started working for An-Nahar newspaper, as a critic of theatre and literature, and has since written for various Arabic magazines and newspapers, including Al-Hayat (Beirut, London), Assafir, Al-Mustaqbal, Kalimat Cultural Supplement (Beirut), Al-Arabi Al-Jadeed (London), Al-Ayyam (West Bank), Al-Quds-el-Arabi (London), Kika (London), Jasad Magazine (Beirut) and Qantara (Paris). His collection of short stories Jokes for the Gunmen, winner of the prestigious Al-Mutaqa Prize in 2016, is published in English by Granta Portobello, translated by Jonathan Wright, with translations into many other languages in the pipeline. The Rats that Lick a Karate Champion’s Ears is his second collection. His story “Boxes” was included in Beirut Noir published by Akashic Books. He is currently working on a novel. His three collections of poetry are Our Grief Resembles Bread (Al-Farabi, 2000), The Camera Doesn’t Capture Birds (2004, 2010), and An Angel Suspended On a Clothesline (2012), translated into several languages including French under the title Un Ange Sur une Corde à Ligne (2013, translated by Samira Negrouche) and Icelandic under the title Ekkert Nema Strokleður (2013, translated by Aðalsteinn Ásberg, Sjón and Kári Tulinius). He has translated into Arabic short stories by international writers, as well as number of Icelandic poets and the following novels: The Blue Fox by Sjón, Hands of my Father by Myron Uhlberg, The Story of the Blue Planet by Andri Snær Magnason, Dwarfstone by Aðalsteinn Ásberg, Flowers on the Roof by Ingibjörg Sigurðardóttir. He lives between Reykjavik and Beirut. 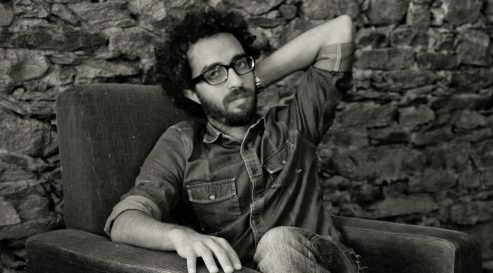 Mazen Maarouf’s writing has been translated into Chinese, Czech, English, French, German, Icelandic, Maltese, Malay, Polish, Spanish, Swedish and Urdu. You can watch a documentary about Maarouf from the programme Artscape: Poets of Protest for Al Jazeera here. The entire series can be found here. Read an interview with Mazen Maarouf and more in Electronic Intifada here.